* Universidad de Antioquia (Medellín-Antioquía, Colombia). liliana.arroyave@udea.edu.co. ** Ph.D. Universidad de Antioquia (Medellín-Antioquía, Colombia). claudia.ossa@udea.edu.co. Tissue engineering (TE) seeks to improve the unsatisfactory development of implants and medical procedures to solve bone and cartilage injuries. TE aims at regenerating tissues using cell growth platforms (scaffolds), which may consist of natural polymers such as polyhydroxyalkanoate (PHA). PHA is an innovative material useful in medical applications due to its degradation capability and bacterial origin that allows large-scale production and control final properties. In this research, we developed commercial PHA scaffolds using the lyophilization technique with a factorial experimental design. We used dichloromethane as PHA solvent, tergitol as surfactant, and liquid nitrogen (N2) for the freezing process. We characterized the PHA by Fourier-transform infrared spectroscopy (FTIR) and thermogravimetric analysis (TGA); and the scaffolds by scanning electron microscopy (SEM) and mechanical compression and hydrolysis degradation tests. The characterization of the PHA indicated that the material is a mixture of PHA and polylactic acid (PLA). The results showed a suitable pore distribution for migration of chondrocytes through the scaffold, in addition to a behavior similar to that of the articular cartilage, although it presented lower mechanical strength. Also, the scaffolds displayed mass loss in a non-linear way related to the percentage of PHA present in the sample. In conclusion, PHA scaffolds have a potential use in tissue engineering for restoring articular cartilage. Atualmente, o desenvolvimento de implantes ou procedimentos médicos para resolver lesões ósseas ou cartilaginosas não cumpre satisfatoriamente com os requerimentos funcionais do tecido afetado; uma solução alternativa é o uso da engenharia de tecidos (IT), que busca regenerar o tecido com plataformas de crescimento celular fabricadas, por exemplo, com polímeros naturais, como o polihidroxialcanoato (PHA), que permite a reconstrução do tecido graças a sua capacidade de degradação, e cuja origem bacteriana permite a produção a grande escala e o controle das propriedades finais. Neste projeto desenvolveram-se scaffolds de PHA comercial, mediante a técnica de liofilização, com um desenho experimental fatorial, utilizando diclorometano como solvente, Tergitol como surfactante e nitrogênio líquido (N2) como congelante. O PHA caracterizou-se com espectroscopia de infravermelho (FTIR) e análise termogravimétrica (TGA). Os scaffolds obtidos caracterizaram-se com microscopia eletrônica de varredura (SEM), ensaios mecânicos de compressão e ensaios de degradação hidrolítica. As análises sobre o PHA indicaram que o material é uma mistura deste polímero e ácido poliláctico (PLA). Os scaffolds mostraram uma distribuição de poros adequada para a migração de condrócitos através deles e apresentaram um comportamento similar à cartilagem articular, mas uma menor resistência mecânica; também se encontrou que a perda de massa está relacionada com a porcentagem de PHA presente na amostra de uma forma não lineal. Em conclusão, os scaffolds de PHA têm um potencial uso na engenharia de tecidos para a restauração de cartilagem articular. The last survey of the National Administrative Department of Statistics (DANE, 2005) showed that, in Colombia, 2,018,078 people have alterations in body function or structure. These conditions deteriorate people's quality of life and involve their social, labor and educational isolation . In many cases, it is necessary to use implants to improve the functionality of the damaged structure; a clear example is the articular cartilage, an avascular tissue unable to self-regenerate . Traditional alternatives to recover cartilage functionality, such as microfracture, generate scars through fibrocartilage that fail satisfying the mechanical, morphological or chemical stresses of native tissue . Cartilage autografts and allografts have difficulties such as low availability, compatibility and morbidity induced in the patient, making these procedures impractical . The prosthesis used to repair articular cartilage can eliminate pain and partially restore functionality, but its lifetime is short  since the materials used to manufacture it do not meet the mechanical requirements . Due to the difficulties restoring cartilaginous tissue, as other tissues in the body, TE proposes the stimulation of tissue regeneration rather than the replacement thereof, making necessary to use cell growth platforms or scaffolds. These platforms provide an ideal environment for the cells to generate their own extracellular matrix; therefore, using materials with degradation capacity is important so they can be replaced by the cell's own extracellular matrix . Consequently, platforms with polymeric biomaterials such as polyhydroxyalkanoates (PHA) have been developed in recent years, thanks to their biocompatibility, adjustable mechanical properties and capacity to degrade without leaving toxic residues . In this study, we manufactured PHA scaffolds by varying the percentage of PHA to determine the optimal manufacturing protocol that balances the mechanical, morphological and chemical requirements of cartilaginous tissue. The polyhydroxyalkanoate (PHA) was obtained from Goodfellow as a degradable polymer for extrusion composed of PHA. The polylactic acid (PLA) and some additives, and the dichloromethane (methylene chloride) were obtained from Químicos J.M. S.A., and the tergitol from AlfaQuímicos Ltda. We used Fourier Transform Infrared Spectroscopy (FTIR) to identify the functional groups , using a PerkinElmer brand Spectrum One model, with a DTGS detector. We prepared the sample by manufacturing a KBr tablet with an approximate ratio of 100:1 mg (KBr/ sample), applying five tons of pressure. We analyzed the behavior of the polymer regarding temperature change through a thermogravimetric analysis (TGA) , with an initial sample size of 15.847 mg, in a TGA Q500 V20.13 Build 39 device and a temperature ramp of 25 °C to 900 °C, at a heating rate of 10 °C/min with a nitrogen atmosphere. To manufacture the scaffolds, we began by dissolving PHA in dichloromethane in percentages of 5%, 7.5% and 10% wt/v (values obtained after previous experimentation), then, we added tergitol to ensure the emulsion of the solution with water. The amount of reagent corresponded to 7.8% w/w of the water and polymer used, mixing for 15 min, then we added water in a volume corresponding to 75% w/w of the polymer and the dichloromethane; the water was added by dripping with continuous stirring for one hour. The water allows the melting temperature of the solution to increase, making sure that the whole system is closed to avoid the volatilization of dichloromethane. We poured the emulsion into cylindrical molds (12.7 mm in diameter and 25.4 mm in height) previously frozen, left the outer walls of the molds in contact with the nitrogen until total freezing, and then lyophilized them for 48 h in a Labconco 2.5 L lyophilizer. Before testing, we washed the samples to remove remnants of tergitol and dichloromethane with 100% ethanol for one hour, followed by 75% ethanol for half an hour, 50% ethanol for half an hour, 25% ethanol for half an hour, and finally distilled water for one hour. To evaluate the morphology of the scaffold porosity, we took micrographs with transversal and longitudinal slices with a scanning electron microscope (JEOL JSM-6490LV) with 3 nm of resolution, at a magnification of 3,000X. We performed compression tests in triplicate for each protocol with a speed of 5 mm/min in a universal testing machine (Digimess TC500), following the ASTM D695-15 standard. Finally, we tested degradation in a simulated body fluid (SBF) at 7, 14, 21 and 28 days with a temperature of 37 °C in triplicate, according to the ASTM F1635 standard. 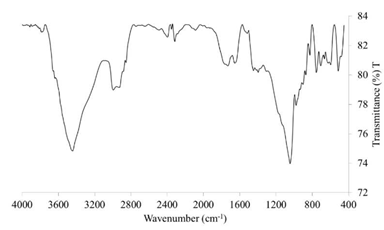 The band observed at 1729.12 cm-1 in the FTIR spectrum (Fig. 1) corresponds to a typical stretch of the amorphous carbonyl group (C = O) of PLA, which is also present in the PHA [9,10] and whose amplitude may be due to the mixture of PLA-PHA by the stretching of carbonyl crystals of PHA, assuming that there is a molecular interaction . Additionally, a band at 2853.44 cm-1 corresponds to the extension of -CH , characteristic of PLA, and another band at 3443.96 cm-1 corresponds to the OH group of the PHA . There are several typical PLA bands present in the cm-1 and 2853.44 cm-1 correspond to the extension of OH characteristic of the PLA , and the band at 1182 cm-1 corresponds to the stretching of C-O of the CH-O group of the PLA that is overlapped. The 3443.96 cm-1 band, corresponding to the OH group, and the 1729.12 cm-1 band, corresponding to the carbonyl group, are typical of the PHA . The bands at 1447.50 cm-1 and 1395.9 cm-1 correspond to the deformation of CH3 and the extension of C-O-C, respectively, both present in PHA and PLA . Apparently, the 1045.49 cm-1 band in the FTIR does not correspond to any component of the PHA nor the PLA, however, two peaks seem to overlap close to 1089 cm-1 and 1057 cm-1, corresponding to a helical structure belonging to the PHA . FIG. 1 FTIR spectrum of a PHA sample. The TGA thermogram (Fig. 2) shows two mass losses: one at 254.98 °C and another at 325.44 °C, corresponding to the PHA and PLA decomposition reactions, respectively. Additionally, a residue of 2.944% is observed around 600 °C. 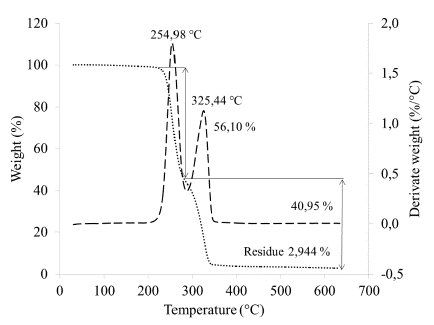 Thermogravimetric analysis of PLA reported in the literature show that this polymer degrades at a temperature between 375 °C and 382 °C; however, the presence of PHA in the compound decreases this temperature . Therefore, we associate the mass loss seen at 325.44 °C with the degradation reactions of PLA. The mass loss observed at 254.98 °C is associated with the decomposition of PHA, which might correspond to polyhydroxybutyrate (PHB) or polyhydroxybutyric acid that is a type of polyhydroxyalkanoate . Guan  reported a degradation temperature for the PLA of approximately 375 °C for PHB/PLA compounds in a 75/25 w/w ratio, and suggested that the greater amount of PHB present in the sample, the lower the degradation temperature experienced by the PLA. Other authors who used PHB and a PHB/PLA ratio of 25/75 reported similar temperatures for the degradation of the PLA: 350 °C  and 355 °C . Therefore, we can conclude that due to the decrease in the degradation temperature of the PLA, the PHA represents the main polymer in the compound studied. It is possible to determine the relationship of the elements present with the TGA, however, to reduce errors, it is necessary to have a TGA curve for each element separately, so that the percentages of weight loss can be determined due to humidity and other aspects. In this case, we carried out the calculations without these precisions, therefore, the result obtained is an estimate; according to this, the ratio of the material is 1.37:1 of PHA/PLA (56.10 / 40.95) . The study of the morphological constitution of the scaffolds showed interconnected pores allowing cell migration (Fig. 3). 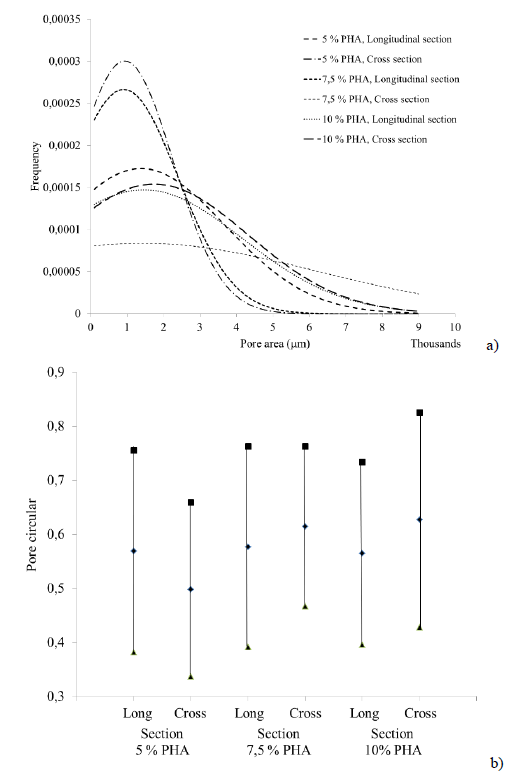 Pore size distribution was quantified in both cross and longitudinal sections (Fig. 4a) using the software Image J. The lack of a clear trend may suggest that the type of slice did not influence pore formation, however, the protocol 7.5% PHA showed the greatest difference, with the pores in cross section being approximately 2.3 times larger in diameter than those in longitudinal section. This phenomenon, which was not evident in the other protocols, may be explained by the transversal direction in which cooling was applied during lyophilization, and by the adequate amount of polymer dissolved that allowed the material to adjust according to the cooling direction. FIG. 3 SEM Micrographs. a) 5% PHA lateral cut, b) 5% PHA transversal cut, c) 7.5% PHA lateral cut, d) 7.5% PHA transversal cut, e) 10% PHA lateral cut, f) 10% PHA transversal cut. The transverse cuts of 5% PHA and lateral cuts of 7.5% PHA showed a greater pore size (approximately 34 mm in diameter) compared to the other protocols (Fig. 3, 4a). The lateral cuts of 5% PHA and the transversal and lateral cuts of 10% PHA had a greater pore size distribution (34-60 in diameter) compared to the previous cuts. Finally, the pore size distribution of the transversal cuts of 7.5% PHA was the most dispersed, frequently with pores of 80 in diameter. Figure 4b shows the circularity of the pores, which are not significantly different. FIG. 4 a) Normal distribution of the pore areas present in the scaffolds, b) Graphical representation of the average and standard deviation of the circularity value of the pores. 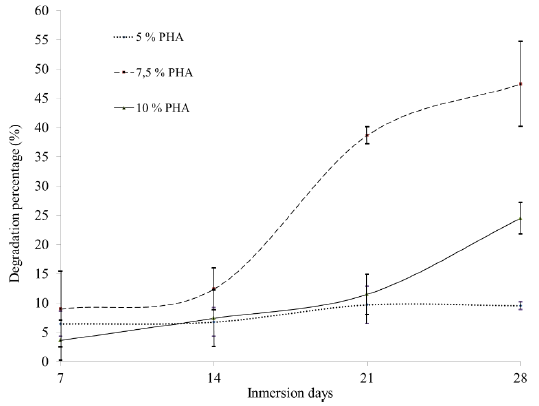 Figure 5 shows the direct relationship between the amount of PHA in the sample and the compression strength: the higher the percentage of PHA, the greater the mechanical strength. FIG. 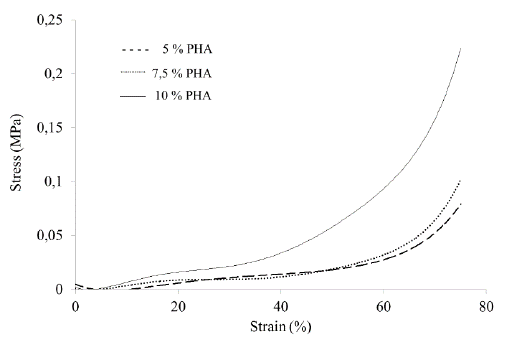 5 Smoothed stress-strain curve obtained from the PHA scaffolds compression test. Fourth generation biomaterials  seek to imitate the properties of tissues through morphological similarity; therefore, cartilage substitutes should have materials that can imitate the tissue's properties. In this aspect, the scaffolds obtained lacked the adequate mechanical strength. The tendency curves (Fig. 5) showed a maximum strength of 0.229 MPa at a deformation of 75%, corresponding to the 10% PHA protocol; this may be due to the greater amount of material that provides greater resistance to compression. However, human articular cartilage resists compression between 1 and 10 MPa at a deformation of 15% . Nevertheless, several studies propose using biomaterials with mechanical strength lower than that of the host tissue , because the mechanical resistance is not only determined by the inorganic material but by the cells and other organic elements such as collagen  that reinforce the material, increasing its mechanical resistance. The mechanical behavior of the cartilage starts with a high percentage of deformation at small loads and decreases as the load increases due to the structure reorganization ; the scaffold manufactured in this study showed the same behavior. The natural behavior mimicry is a promising sign for using PHA scaffolds as a chondrocyte growth platform. Figure 6 shows the degradation curves determined through the mass loss for the PHA scaffolds over time. It is evident that the protocol 7.5% PHA allowed the degradation of the sample up to approximately 50% in 28 days, unlike the other two protocols: for 10% PHA, a maximum value was reached around 25%, and for 5% PHA, which had the lowest percentage and the greatest stability over time, a degradation value of approximately 5% was reached. FIG. 6 Graphical representation of the PHA scaffolds mass loss during the degradation test. The 7.5% PHA protocol had a higher rate of degradation compared to the other protocols (Fig. 6). This phenomenon can be explained considering the results of the SEM micrographs (Fig. 2), since the morphology of the pores of this protocol is the only one that is determined by the direction of the freezing gradient applied on the precursor solution of the scaffold, therefore, the proportion of 7.5% of PHA allowed controlling the orientation of the pores, and facilitated the degradation in a simulated body environment. According to Cedeño et al. , the growth capacity of chondrocytes after eight weeks of an implanted graft is 50% to 90% and depends on the cellular stimulus. Although the test carried out does not contain cells, the SBF solution represents a physiological simulation, which makes possible to compare with the results of this study. The scaffold of 7.5% PHA was degraded by 50% after four weeks of exposure, which is very promising, since with the appropriate stimulus an adequate degradation rate can be achieved for the proliferation of chondrocytes in a cartilage implant. The scaffolds obtained using different percentages of PHA have adequate porosity characteristics for cell migration, since they have interconnected pores ranging from 34 um to 500 um; given that the chondrocytes have sizes between 30 um and 40 um, the pore sizes obtained would allow migration inside the scaffold. The scaffolds with 7.5% PHA showed significant differences between the pore sizes in transversal and longitudinal sections; this may be due to the freezing gradient direction, which could have influenced the scaffolds degradation capacity, with percentages of 50% compared to the other protocols that lost approximately 10% and 25%. The mechanical compression strength of all the PHA scaffolds was low compared to that of natural cartilage; however, the mechanical behavior is similar to the articular cartilage, making these scaffolds an excellent option for tissue regeneration. The authors thank the Biomaterials Research Group (BIOMAT) from the Bioengineering Program at the University of Antioquia for financing the project, and the members of the Research Group for the support in its execution. 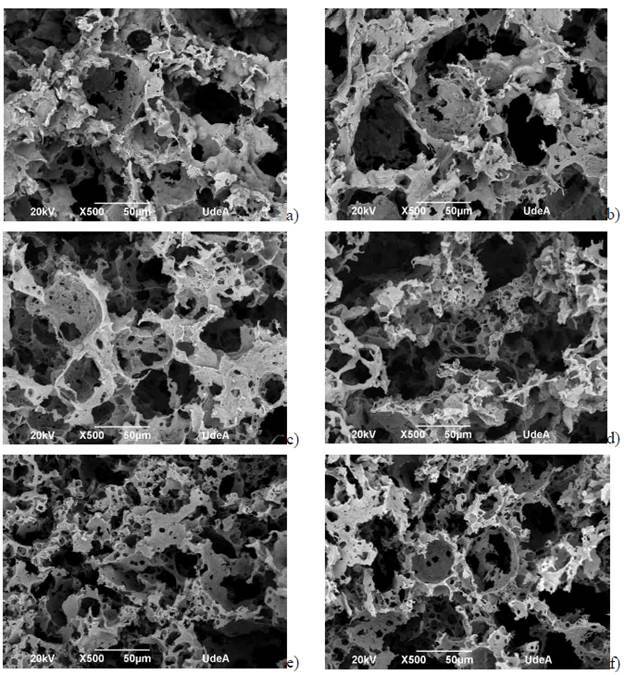 Cómo citar este artículo: L. M. Arroyave-Muñoz, and C. P. Ossa-Orozco, "Morphology, mechanical strength and degradation of polyhydroxyalkanoate scaffolds," Rev. Fac. Ing., vol. 27 (48), pp. 61-70, May. 2018.